Mother-Daughter activities abound around Mother’s Day and most churches host fun activities for women to be able to spend time with their daughters or focus on being a “daughter of the King.” Have you ever considered changing up the normal routine of events and focusing on those Mamas with sons in the family? I know this post is a little early to help you with some planning ahead if you’re interested in changing up your Mother’s Day event this year or making plans ahead for the following year. This can be a lot of fun! Don’t discriminate between ages, let older men bring their older mothers if they want to and let mothers bring their younger sons too. If you allow the older men to come with Mama then it will show the younger men to show honor and respect to their mothers for their whole life. It will also give you a source of help for cooking during the cook-out and men who can do the devotion or be the drivers for the day-trip excursions. 1. Son-Hosted Grill Out/BBQ – Have the sons grill up meat for the mothers and have a picnic on the church grounds. Moms bring sides! 2. Mama-Son Baking Championship – Do a bake-off between families, having the mothers and sons cook up a baked dish and compete with each other. Add a twist by giving them a theme to base their baked goods from. P.S. If you’ve ever watched the hit show “Kid’s Baking Championship” on The Food Network then you will learn there are great boy chefs! 3. Lego Build Banquet – Boys love Legos, so why not have a Lego-themed event!? All you need are tables, legos, and decorations. Let the boys build to their heart’s content. Devotional Idea: “Lego and Let God,” talking about how mothers raise their sons for the Lord and then let go and allow God to take over their life. Or perhaps a devotion about building your life upon God’s foundations. 4. Raising Knights Night – Using a medieval theme you can teach Christian boys how to treat a lady by allowing them to be a valiant knight for their mother. Devotion Idea: Gentlemanly etiquette and Biblical advice on raising a knight. 5. Be Mom’s Super Hero Banquet – The idea is like that from above, concentrating the focus on teaching boys how to be a hero for women, especially defending and respecting their mothers. The super-hero theme is not complete without thinking of Christ’s love and tenderness toward Mary, His mother. Use primary colors for decorations, wear capes, and have fun with it! 6. Mother-Son Bowl-A-Thon – Gather up all the gals and guys and rent a few lanes at the bowling alley and just get out and enjoy those stinky bowling shoes and a striking afternoon game together. 7. Mother-Son Hike/ Nature Walk – Organize an outdoor hike and walk for either a day trip or a nearby adventure locally. Plan a picnic and have them enjoy God’s creation together! 8. High Tea with Son and Me – Have a dainty tea set up for mothers and sons to enjoy little sandwiches, punch/tea, and little desserts. This seems a little too close to what is normally done for mother-daughter events but this could be an exercise on teaching a young man to treat his mother to a fine date and wear his Sunday best and enjoy each other’s company. This is great training for men to learn the value of dating their future wives. 10. Board Game Bonanza – Have an afternoon of fun with snacks and games enjoying mother-son bonding time playing board games with other mom-son competitors. 11. Birdhouse Build Day – Create a time of building (what boys like) a birdhouse together and then decorating/painting it together (what moms like). Devotional ideas: Putting together a life for God, Preparing your heart for God to live in (like you prepare a birdhouse for a bird’s family). 12. Dessert Potluck – Need an idea in a hurry? Just invite mothers and sons to bring desserts and enjoy a dessert potluck in the church fellowship hall together on a Saturday afternoon. Devotion Idea: Be Sweet to Mama – Be Sweet to Son (Use examples from God the Son). 13. Mama/Son Picture Booth – Okay, so this would be something you can incorporate to any of the events! You could also find a background and a photographer, and perhaps a few props for a fun activity to do on Mother’s Day Sunday itself for all children and their mothers. Set it up in the foyer or another easy spot to get access to and you can give them a great memory to cherish for years to come. 14. Coffee and Cookies Campout – Mix a camping theme with yummy coffee and cookies and you’ll have a great mother-son connection. Imagine tents and fake campfires in your fellowship hall and cowboy coffee (or real!! )made on electric burners surrounded with plates of cookies made by Mom. OR break out the patio fire pits and use them outside in someone’s backyard instead! Devotion Idea: How Parenting is Like Camping – Crazy things happen on camp-outs just like in parenting but when it’s over you cherish the adventures! 15. Talent Show/Hobby Highlight Night – Showcase the talents of your mothers and sons by allowing them to have a time to share their God-given abilities for the church or for the other mothers and sons. Ensure the content is appropriate by having a sign-up sheet with what each family will be performing for each other. 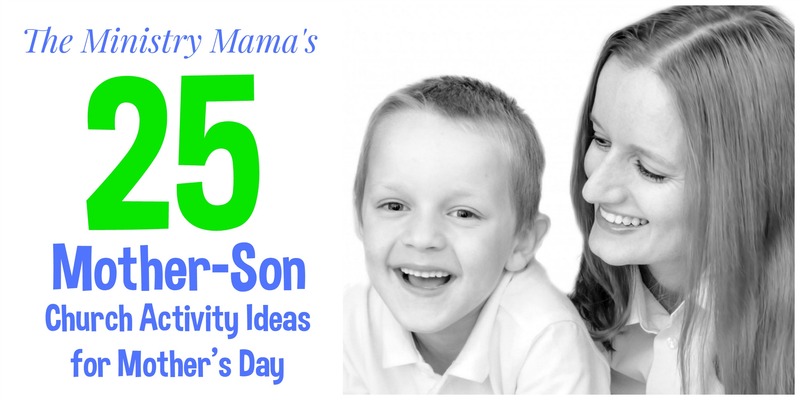 Mother-Son ideas could be: duets, instrumentals, comedy/skits, scripture recitation, etc. 16. BYOB – Bring Your Own Breakfast – Meet at a park for an early morning picnic and have each mother-son duo bring their own breakfast to eat. Devotion idea: “Joy Comes in the Morning” Highlight the godly benefits of being a joyful mother and a godly son. 18. The Amazing Race Adventure – Create your own local scavenger hunt placing other mothers and sons on teams working together to carry out tasks and find clues that will lead them to a common place to enjoy time together. 19. Go-Kart Championship – Enjoy an afternoon at a local Go-Kart track. Rent a place for the afternoon and enjoy mom-son competition and speed! 20. Mother-Son Pottery Painting – Pottery painting is not just for girls! Creative boys would like to make something they can take home or maybe even a gift for Mama. Check out your local pottery painting place and see if you can rent a room for an afternoon. 21. Theme-Park Trip – Do you have a theme park within a day’s travel? Gather a mother-son group and set out for roller coasters and rides for a fun day trip. 22. Ice Cream Social – Ice Cream + Moms & Sons = Special Memories. Provide the ice cream and have the ladies bring the toppings. An exciting edition to this would be to create a “Giant Banana Split” like you can find here. Devotion Idea: God sprinkles blessings on us just like we’ve sprinkled toppings on our ice cream. Even though we can have cold times (like ice cream) God can make them sweet. 23. Glow Game Night – This can be a fun night activity done indoors at church or outdoors. Include black lights, glow in the dark paint, and more! Create fun games using glow sticks where mothers and sons can compete to win prizes together. 24. Card Game Carnival – Set up a variety of card games at different tables. Rotate the groups through the tables to be able to play a variety of card games together. Or drop the card games and just have a carnival with carnival games! 25. Mother-Son Lock-In – Gather the boys together with Mamas and enjoy fun at an all-nighter! Moms and sons can enjoy doing all types of activities (incorporate a conglomeration of the things listed here for a night of fun!). Choose a theme to go along with the lock-in and you’ll be able to focus on decorations, food ideas, and the devotions. Have a son bring the devotion to the group at some point in the evening. Don’t think mothers will attend all night? Then end at midnight. Thank you so much for coming by and taking a look at these ideas. If you ever use one and do your own Mother-Son event please take some photos and send them to me in an e-mail! I’d love to see your creativity. I’ve Got it Better Than the Angels!